No matter what you do, babies go through a lot of diapers. It's unavoidable (unless your baby is an instant star at Elimination Communication) and whether you use green diapers or disposables, you're going to need somewhere to stow all those stinky, soiled diapers. 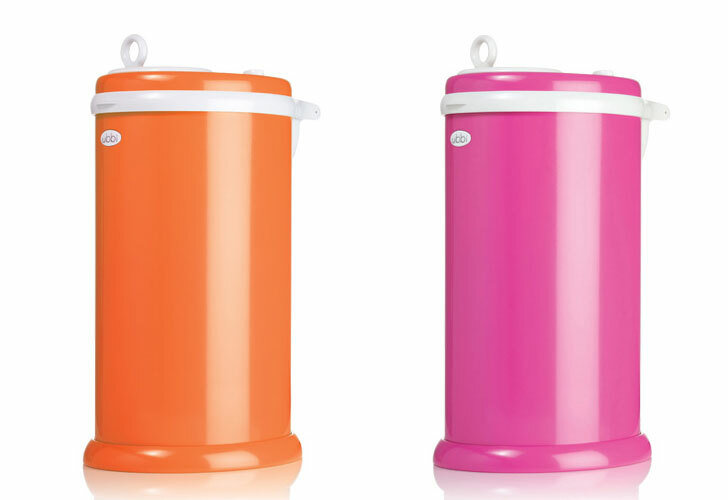 The Ubbi Diaper Pail will keep your nursery clean and stink-free with rubber seals and a sliding lid that locks odors inside. Another smell stopping plus for the Ubbi - it's made from powder-coated steel, which is easy to clean and odor resistant. And unlike many diaper pails, this one is made to use with either green diapers or disposable diapers. Many plastic diaper pails keep the stink in by packaging each diaper in a separate plastic bag section, but you don’t need any special bags for the Ubbi Diaper Pail, any tall kitchen trash bag will do. If you’re using green diapers, you can purchase a special Cloth Diaper Pail Liner. The waterproof, odor-resistant cotton and polyester bag is machine washable, so you can toss it in the same load with your dirty cloth diapers. The Ubbi gets a thumbs up for modern green nurseries for the fun array of colors it comes in. Choose from a neutral like grey or white, or go for a fun pop of color like hot pink, orange or purple. If your nursery or diaper changing area is short on space, don’t worry. The Ubbi has a sleek oval shape, rather than being round like most diaper pails, so it’s easier to fit into small areas. You might notice the Ubbi looks similar to the VIPP Diaper Pail, the type of trash can many doctors use, but while the VIPP costs more than $300, the Ubbi is a budget-friendlier fraction of the price. And because the Ubbi isn’t made of odor-absorbing plastic, it can be cleaned up and used as trash can once your child is potty trained. Many plastic diaper pails keep the stink in by packaging each diaper in a separate plastic bag section, but you don't need any special bags for the Ubbi Diaper Pail, any tall kitchen trash bag will do. If you're using green diapers, you can purchase a special Cloth Diaper Pail Liner. The waterproof, odor-resistant cotton and polyester bag is machine washable, so you can toss it in the same load with your dirty cloth diapers. The Ubbi gets a thumbs up for modern green nurseries for the fun array of colors it comes in. Choose from a neutral like grey or white, or go for a fun pop of color like hot pink, orange or purple. If your nursery or diaper changing area is short on space, don't worry. The Ubbi has a sleek oval shape, rather than being round like most diaper pails, so it's easier to fit into small areas. 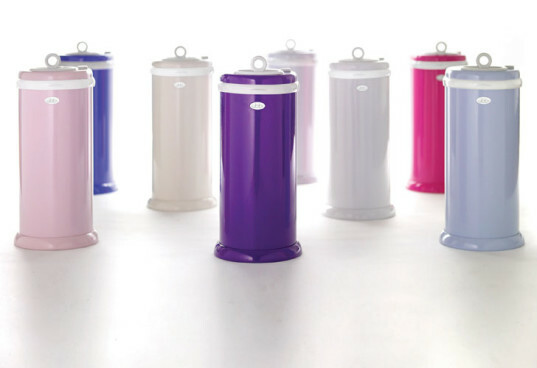 You might notice the Ubbi looks similar to the VIPP Diaper Pail, the type of trash can many doctors use, but while the VIPP costs more than $300, the Ubbi is a budget-friendlier fraction of the price. And because the Ubbi isn't made of odor-absorbing plastic, it can be cleaned up and used as trash can once your child is potty trained.